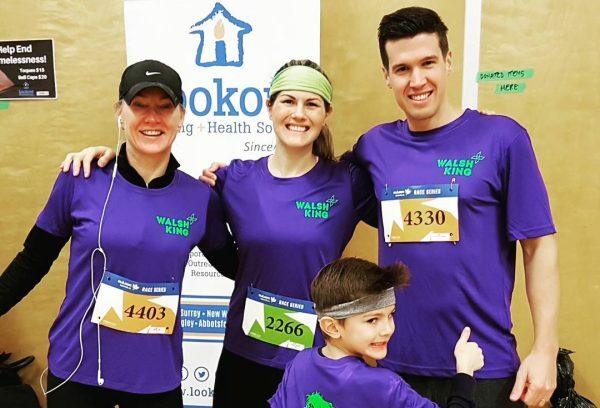 Some members of the Walsh King team recently braved the cold winter rain of Vancouver to get outside and run around. We took part in the Chilly Chase, an annual Vancouver run that attracts thousands of people from around the Lower Mainland. There is a range of runs to choose from at the Chilly Chase (5K, 10K, 15K, half marathon). My six-year-old son, Rook, and I picked the 5K; Walsh King Partner Tia Walsh and Staff Accountant Patrick Harrison did the half marathon; and Staff Accountant Graem Bradsen decided to downgrade from the half to a 10K at the last minute because he was just getting over a bad case of strep throat. I was impressed that he ran at all! Funny story about Graem – he did the BMO Half Marathon last year. It was his first organized run and he killed it! He finished in an amazing 1 hour and 33 minutes. And at the Chilly Chase, having just recovered from being sick – he came in the top 10 overall for the 10K. As for running with a six-year-old… well – let’s just say my training effort leading up to the run did not quite match my performance on the day. Along with regular shoulder checks to make sure that I was okay and close by (which means behind him! ), Rook jumped through every puddle along the route and still outpaced me the entire time. Towards the end, my little guy slowed down his pace and ran with me to the finish line. He said he was tired of running by himself. It was a humbling experience for me – and one that also made me laugh. Even though the weather was tough – the rain was relentless and it was cold – we all had a great time. It is one of the things I really like about working at Walsh King – we’re more than just “friendly at work.” We spend time outside of work together because we genuinely like each other. Maintaining a positive company culture is a priority at Walsh King and this activity is just one example of the team spirit we have.